Witness The Fek'Ihri S'torr Warship! During the upcoming 2018 Winter Event, players participating in the festivities available at Q’s Winter Wonderland can earn Winter Prize Vouchers (2018) by running the “Fastest Game on Ice” once per day. Earning a total of 1000 vouchers will allow players to complete an Event Reputation project that rewards a Fek'Ihri S'torr Warship [T6]! Once this starship is obtained by any character on your account, all of the characters on your account will be able to claim the Fek'Ihri S'torr Warship [T6] from the Account Claim tab within the Event Store (in the Event Reputation window). We are also excited to announce that this starship will be the available on PC, Xbox One and PlayStation 4 on the same date! 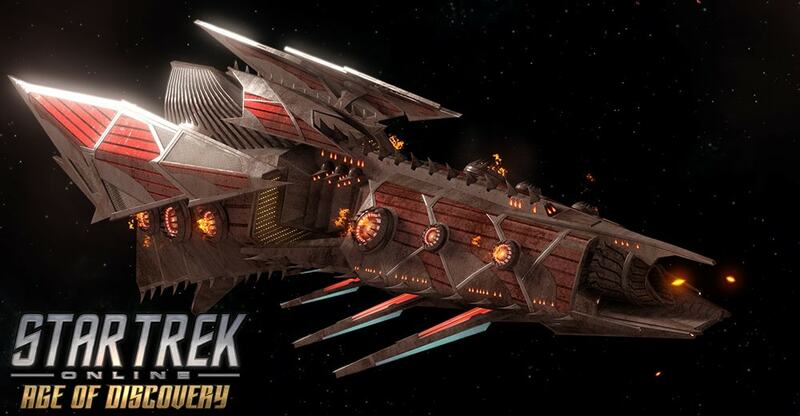 The Fek'Ihri S’torr Warship is a fearsome Fek'Ihri design, with highly specialized technology onboard that shows why the Fek’Ihri have been haunting the Klingons for centuries. The Fek’Ihri S’torr features a Lieutenant Commander Universal/Pilot Specialization seat. The Fek’Ihri S’torr comes equipped with a Console - Universal - Chains of Fire. When activated, this ship tethers itself to nearby ships and discharges massive fire blasts at them. This pulls the ships in and deals massive fire damage to them for a short duration. This console also provides a passive boost to Fire Damage, Impulse Thrusters, and Flight Speed. This Console can be equipped in any console slot on any ship. You may only equip one of these consoles. After achieving level 5 in the Fek'Ihri S’torr Warship Starship Mastery, you will unlock the "Maw of Gre’thor" Starship Trait. While this trait is active, traveling at full throttle will periodically cause massive bursts of fire to launch behind your ship, dealing fire damage to all those hit. Affected foes will additionally take Fire Damage over Time. The Fek’Ihri S’torr comes equipped with a Chains of Fire console. This powerful console blasts nearby foes with fire when activated. It then latches on to the affected ships, dealing fire damage as it drags them along with you for a short duration. This console also provides a passive boost to Fire Damage, Impulse Thrusters and Control Expertise. This console mod can be equipped on any starship in any console slot. You may only equip one of these consoles. 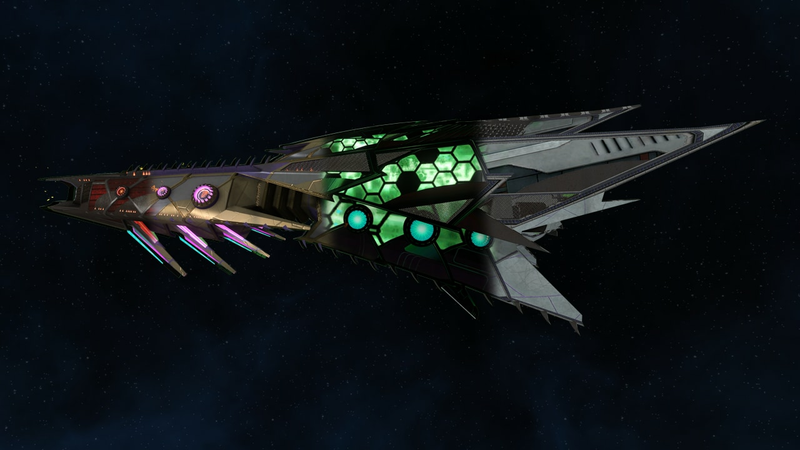 Upon reaching Level 5 in your Fek’Ihri S’torr Warship [T6], you will unlock the Maw of Gre’thor Starship Trait. With this trait is slotted, going at full throttle while in combat will shoot giant bursts of flame behind your ship, dealing fire damage both initially and over time to all foes affected. Click the thumbnail below to see the ship with all the different vanity shield options in the game!